In Act Without Words 1 the protagonist, played here by Joe Eyre, is an Everyman, Tantalus or Adam. On a deserted stage and using mime, he is shown to grab at objects which are then inexplicably taken away from him in a sadistic game. It is supposed to be that we never see Beckett’s characters attached or embedded within their environments (at conflict with nature) thus reinforcing the idea that they are controlled or at least affected by, unseen and perhaps malevolent forces. Here though, Sara Joyce lays bare the technical trappings of theatre and we see cast members as faceless stage hands, lowering objects on pulleys to tantalise our man who is stuck in Beckett’s white light of a desert, here transposed to a darkly lit backstage area. But objects, obeying Flagle’s Law, are supposed to drop inexplicably and then sway just out of reach of our grabbing frustrated character. And every time he makes a run for it, he is flung back by that same unidentified omnipresent and omniscient presence. But whilst it solves the space problem for this play in the Old Red Lion’s studio (there is no space for things to just crash down) splitting the force against which the man fights, when it should perhaps be one and the same, lessens its meaning and the ambiguity that we should be left with at the play’s end (the man gives up? or is his giving up the act of his first rebellion and refusal to play the game?) The electronic music is fun, Joshua Pharo’s ghostly neon light implies we are caught in an endless video game, and the nature of the sound of Greg Harradine’s whistle, which is recorded, is symbolic- it cannot be identified and it is dispassionate, homogeneous and therefore frightening- it is has the same simplicity and banality as the layout of the shopping aisles in my local supermarket (the whistle sounds like it has come off one of those horrendous money saving adverts at Asda or Tesco) which makes it all seem like the man is caught in a loop of an episode in Black Mirror. The dance movements help the mime which critics often complain lacks typical Beckettian invention. But Beckett needs space, cold hard space and whilst this piece is fun, it feels a little too warm and consoling, rather than focusing on the experiential angst the man is caught in. Rough for Theatre II features a man, Croker, standing on a window sill who can’t decide whether to jump or not, whilst inside the room two bureaucrats, Bertrand and Morvan, deliberate his existence through the cruel, self serving and unimaginative written testimonies left by his friends. Beckett is all about transforming the commonplace into the unendurable isn’t he? Thinking back to the first short play. Here, we have two men who perform inventories of the man’s life in a bid to help him decide whether he should kill himself, as he stands with his back to us (between Bertrand and Morvan- other productions have had Croker reflected in a mirror) in a light that I can describe only in terms of a painting by Jack Yeats, whose title I forget, but which features a man leaning glumly over the river Liffey and contemplating jumping in perhaps. The effect gives Croker, who is here to remind us of language’s inability to adequately sum up the meaning of a man’s life, a beatified presence whose psychological weight, swirling about in phials of mist, has all the energy of a soul painting by Edvard Munch. Bertrand and Morvan sit less easily in their roles, there is less delineation between their characters that hark back to Vladimir and Estragon, and the action of the play, taking place at a slight diagonal, means that it is harder to have a sense of place. We are meant to be in an apartment but here Charlie Marie Austin’s stage being so uncommon means that Croker’s predicament is framed in less realistic terms and the juxtaposition between the common place and the unendurable, is lost a bit. Catastrophe is the last of the plays and it is fitting it comes third, as it gives us a man finally in defiance of those forces trying to control him. P stands on a cube. A female assistant A and a director D, peruse him in perfect stillness, until A asks D whether he likes him. The perusing continues. D does not like this or that, A strives to make it alright. D finally retires to the Gods to see how well P looks from the depths of the auditorium. This is when P finally makes his defiant gesture in the dying lights. Dominic Grove who plays P has a face that Rembrandt would have paid any amount of money to paint. Meanwhile the face of dictatorial D (Bryan Moriarty) that of power and tyranny, is kept hidden from us, wrapped away, and we are reminded of our continual need and excuse to objectify flesh in order to ignore its subjectivity so that we can do what we want with it. 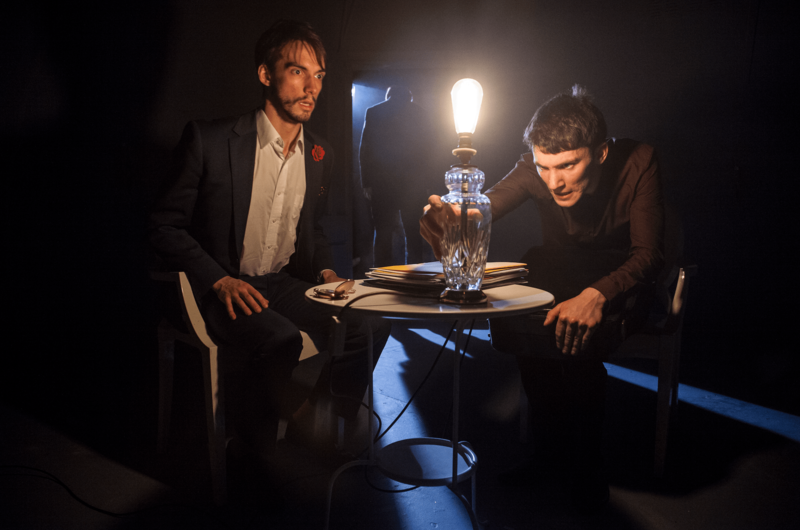 Kate Kennedy as A is the perfect even slimy acquiescent servant, director Sara Joyce creates the perfect theatrical prison and what a picture of ideological hegemony is A…. Kate Kennedy as A exemplifies the qualities of patience and emulation needed in an involuntary subordinate to prop up a self serving manipulating hierarchical system. This is the most startlingly and most uneasy of all the pieces. Three Short Plays with production company Whispering Beasts, continues at The Old Red Lion Theatre until 25th April.